As warmer weather and longer days approach, the Spring equinox is just around the corner – and it’s time to break out of Winter hibernation and into a brand new season. Spring time offers more time outdoors in the fresh air and a sense of aliveness as new plants shoot up from the ground, but it’s no secret that we don’t always feel as energised and alive as we’d like…. If we take a look at the science of Ayurveda, we notice that early Spring is governed by the Kapha dosha, which brings with it lethargy, poor digestion, sluggishness, and heaviness. While many of the qualities of Kapha are positive: strength, good immunity, grace, calmness and kindness – it’s the aspects of poor digestion and lethargy we tend to notice the most. Spring is a time to make the most of what the rest of the year has to offer, to set new intentions for the season to come, and maybe become a little more active and adventurous as the sun shines for a little longer through the day. The ingredients in this simple smoothie all help to bring more vitality back to the body after the Winter. They’re energising, and because they boost the body’s circulation, they’ll also help muscles and tissue recover from new outdoor adventures. Cayenne: If you need something to wake you up in the morning that isn’t coffee, make cayenne pepper part of your breakfast routine. The spicy red pepper is well known for stimulating the digestive tract, and aids in the production of saliva, important for kick-starting the digestive process. Containing high levels of capsaicin, cayenne is useful for decreasing joint pain, so can help if the body feels achy after a long walk on a Spring day. Turmeric: Not pictured here (because if it was, everything would definitely be stained very yellow, as with all things that include turmeric….) but it’s a herb which I believe is absolutely essential to maintaining good health on the inside. Turmeric promotes healthy cell rejuvenation and actually attacks cancerous cells and prevents them from multiplying. Cinnamon: Good for digestion, and a no-sugar way to sweeten meals and drinks – cinnamon is also a brilliant blood sugar balancer, therefore maintaining steady mood levels. It’s all very well eating healthily, but knowing why and how we’re doing it empowers us with the knowledge to make more healthy choices in each situation. Beetroot: Beetroot is extremely high in iron, which a lot of people who follow a vegetarian or vegan lifestyle are at risk of missing out on. A lack of iron contributes to low energy levels and may result in anaemia, but luckily it’s not difficult to find plant-based foods that contain plenty of it. 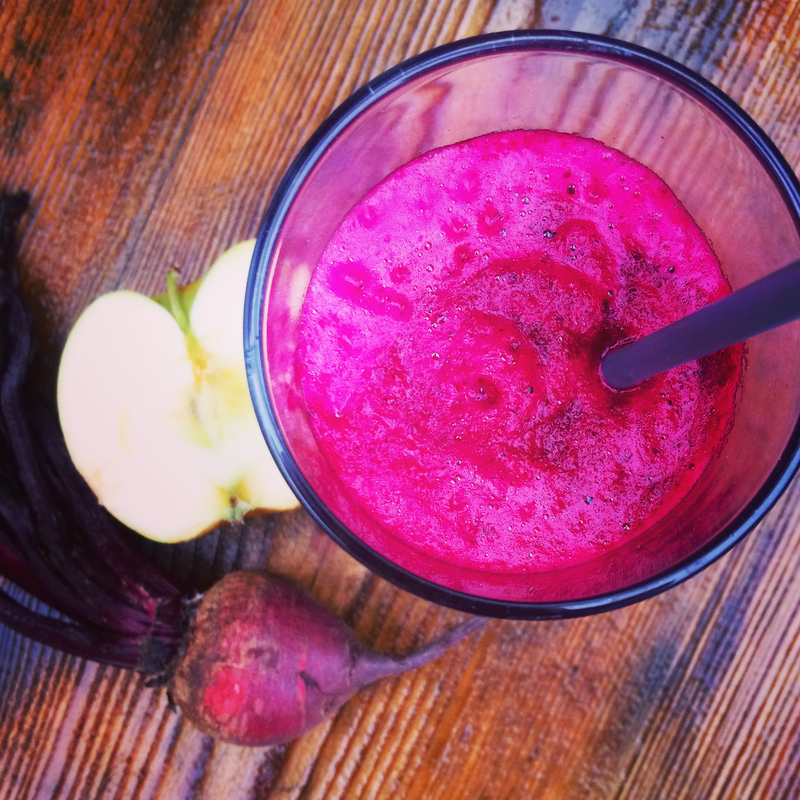 One of the best foods to increase blood circulation, beetroot is one of the foods to choose before and after exercise in order to ensure the muscles are able to receive enough blood circulation to function to their full potential, and repair damaged tissue afterwards. The benefits of boosting circulation don’t end there though, this increase in circulation effects every little part of us, including improving brain function, mood and blood pressure levels. Apple: There’s a reason for the saying ‘an apple a day….’, Apples have the ability to prevent the effects of aging on the brain, and therefore Alzheimer’s, and they contain soluble fibre, which helps increase our feeling of ‘fullness’, making us less likely to reach for an unhealthy snack instead. This fibre is vital for healthy digestion, and has a detoxifying effect on the liver – so make sure you have this smoothie recipe on hand after a night out…. Ginger: A brilliant aid for digestion, ginger boosts agni, or ‘digestive fire’, which the Kapha dosha is notoriously low on. Most of these ingredients reduce inflammation , but ginger is especially effective at treating inflammation of the colon as it contains highly potent anti-inflamatory compounds known as gingerols. If your digestion could do with a little help this Spring, then add some extra ginger to your diet to release any build up of intestinal gas and its also so soothing for the intestines. Berries: High in antioxidants, berries are another anti-inflammatory food, and they’re also well known for their circulation-boosting benefits. Because of the high amount of antioxidants and flavonoids called anthocyanidins, berries slow the decline of cognitive function over time, especially the part of the brain responsible for memory. Up your intake of berries, and you may remember to change the clocks this Spring time…. Banana: High in potassium, bananas are the perfect food for boosting energy and mood levels. They contain high levels of tryptophan, which is then converted by the body into serotonin – a feel-good neurotransmitter. The self-packaged fruit is full of vitamin B-6, which strengthens the nervous system and helps with the production of immune-strengthening white blood cells. When eating a banana, healthy digestive enzymes are produced in the gut, which helps the absorption of nutrients, and also friendly bacteria which aids in that all important good digestion! Add all ingredients to a blender and cover with water. The more we learn about looking after our own health, the more we’re able to care for the health of those around us, and we then start to change the world from the inside-out.